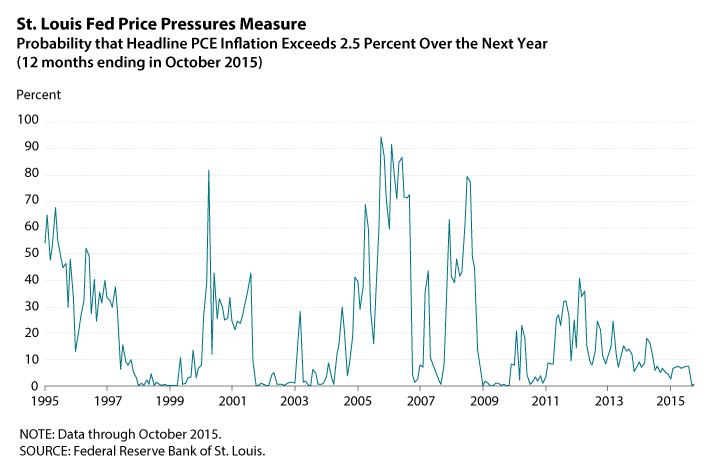 Laura E. Jackson, Kevin L. Kliesen, and Michael T. Owyang of the St. Louis Federal Reserve have constructed a new measure they call the price pressures measure (PPM). In technical terms, the PPM index is constructed from an ordered probit model that is augmented with nine “factors.” A factor-augmented model is a common method of incorporating a large amount of data in a parsimonious fashion. The nine factors, comprising 104 separate data series, are grouped in the following categories: (1) consumer price indexes, (2) producer price indexes, (3) commodity prices, (4) housing and commercial property prices, (5) labor market indicators, (6) financial variables, (7) inflation expectations, (8) business and consumer survey data, and (9) foreign price variables. The ordered probit model provides probabilities that inflation will exceed 2.5 percent, on average, over the next 12 months. But the model also allows us to assess the probability that inflation will average something different. In our original article we structured the model to assess the probability that inflation will fall within one of four bins: less than zero (deflation); 0 percent to 1.5 percent; 1.5 percent to 2.5 percent; and more than 2.5 percent. We could also assess probabilities for other outcomes. For example, we could condense the second and third bins into one, leaving three sets of probabilities: Inflation will be less than zero (deflation) over the next 12 months, inflation will average between 0 percent and 2.5 percent, and inflation will be greater than 2.5 percent. So what is the measure saying now? This is obviously wrong – we can never say that there is a zero percent probability of anything, but ok this is the kind of result you sometimes get from probit models. That however, is not the important thing, but rather the key message here is that there is very little likelihood that Fed will overshoot it’s inflation target in the coming next 12 months. In fact it is very clear that the likelihood of deflation is higher than inflation being above 2.5% in 12 months. Therefore you gotta ask yourself why does St. Louis Fed president James Bullard continue to argue for the Fed to hike rates? After all the research done by his own research department tells him that he rather should worry about deflationary risks. PS See the original paper on the Price Pressure Measure here. PPS Scott Sumner should be delighted that Laura E. Jackson recently became an assistant professor at Bentley University.